The term, “Special Interest Aliens” (SIA’s), also known as “Aliens from Special Interest Countries” is used by the Department of Homeland Security to describe subjects from countries with direct links to terrorism. Most Americans likely presume that the agencies responsible for safeguarding our borders would indeed treat such entries with special interest. However, some might say that such special interest is misdirected by the Department of Homeland Security, as the agency expands inordinate efforts to deter media coverage and subvert the release of statistics related to the entries of aliens from terrorist countries into the United States via the porous U.S./Mexico border. Michael Braun, former Chief of Operations at the Drug Enforcement Agency, testified at a House Foreign Affairs Committee hearing on Feb. 2, 2012 that terrorist organizations have formed dangerous alliances with drug cartels in Mexico, which allows them to “operate freely in our neighborhood” and warning that the U.S. would regret it if these matters were not taken seriously. “I don’t want to sound too crude, but I think there’s going to be hell to pay in the not too distant future,” Braun concluded. Special Interest Aliens typically enter the U.S. in one of three ways: with a legally issued travel document, by fraud or by penetrating our borders undetected. One of the most popular hubs for entries of terror suspects is the largest and busiest land border crossing in the world, San Ysidro Port of Entry. Located at the crossroads between San Diego and Tijuana, this massive port sees over 50 million travelers annually and is projected to process 85 million travelers by year 2030. The sheer size of the port greatly increases the odds for unsavory elements successfully crossing the border. Terrorists know it all too well. Abdallah Nafisi openly called for terrorists to bring weapons of mass destruction into the U.S., specifically referring to the pedestrian entry tunnel at the San Ysidro Port of Entry. In the video, Nafisi boasted that anthrax “carried by a fighter through tunnels from Mexico into the US would kill 330,000 Americans. 9/11 will be small change in comparison. There is no need for airplanes, conspiracies, timings and so on. One person, with the courage to carry 4 pounds of anthrax.” Abu Musab al-Zarqawi, the mastermind of many of the terror attacks in Iraq, also discussed the ease of infiltrating the US through our land borders with Mexico. Border officials routinely encounter suspects from terrorist countries masquerading as Mexican nationals, entering the U.S. as imposters, buying their way in or entering the country with a visa and never leaving. 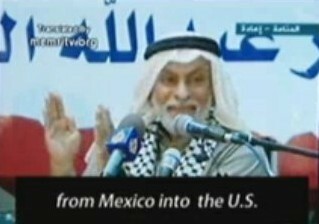 Federal Bureau of Investigation Director Robert Mueller testified that “there are individuals from countries with known al-Qa’ida connections who are changing their Islamic surnames to Hispanic-sounding names and obtaining false Hispanic identities, learning to speak Spanish and pretending to be Hispanic immigrants” to penetrate our land borders with Mexico. Amine el-Khalifi, who allegedly attempted to conduct a suicide attack at the U.S. Capitol was a visa overstay, as were several of the 9/11 hijackers. Burgeoning numbers of terror suspects travel to Mexico from various parts of the world, in order to cross the border into the United States. Our authorities are aware of the massive concentrations of such aliens near the U.S./ Mexico border. Mahmoud Kourani (the brother of Hezbollah’s security chief in southern Lebanon) came through the San Ysidro Port of Entry in the trunk of a car, after bribing a Mexican embassy official in Beirut to get a visa. Kourani (trained in spy craft, weapons and intelligence) later settled in Dearborn, Michigan. Salim Boughader was arrested for smuggling 200 Lebanese, including Hezbollah operatives, across the same border. A woman named Farida Goolam Mohamed Ahmed penetrated the land border with Mexico, ferrying instructions from a Pakistani terrorist group to U.S.-based Al Qaeda operatives. Two Hamas operatives, Mahmoud Khalil and Ziad Saleh, had entered the U.S. after paying a smuggler $10,000 each to take them across the border. The list goes on and on. In spite of these alarming realities, the Department of Homeland Security frequently failed to enroll subjects from Special Interest Countries into NSEERS (The National Security Entry-Exit Registration System), which was created specifically to track entries of subjects from Special Interest Countries. In one such instance, 23 subjects from Special Interest Countries have crossed the U.S./Mexico border on a date pinpointed in Bin Laden’s papers as a “target date” – 4th of July, 2004. When the failure to enroll these subjects in NSEERS was questioned by the media, former Commissioner Robert C. Bonner’s office initially claimed that the subjects were enrolled in NSEERS, but later admitted they weren’t, because such an enrollment was “discretionary”. What this means in simple terms is that if a Customs and Border Protection Officer didn’t feel like enrolling a subject from a terrorist country in NSEERS, they didn’t have to do it. Without enrollment in NSEERS, terror suspects were able to remain in the U.S. for years, undetected until it is too late. On April 27, 2011, the Department of Homeland Security eliminated NSEERS altogether, calling the program “redundant” and “unnecessary”. In addressing media inquiries about the 4th of July fiasco, Commissioner Bonner’s office prepared an internal memo, discussing the need “to craft responses to negative media/congressional attention for high-level cases”. The truth doesn’t need to be “crafted”. Of course, telling the truth would include telling American people and the media that no Intelligence officers were on duty during that “Date to Watch of Special Importance”, previously identified in various intelligence alerts as a date selected by Al Qaeda for an attempted penetration of the U.S./Mexico border. At that point in time, there was no procedure in place for notifications from the Ports of Entry to the Command and Control Intelligence Coordination Center (CCICC). Only two CBP Officers were assigned to CCICC to handle the largest and busiest land border crossing in the world. We can only hope that things have improved since then. According to Janet Napolitano, the Department of Homeland Security is working with Mexico in addressing entries of Special Interest Aliens via the U.S./Mexico border. Some may question how successful that strategy might be, keeping in perspective that similar reliance on our government’s partnership with Mexican officials had proven fruitless in the war on drugs. Napolitano stated that our border security is not a first priority, stating that “wehave to look at our physical borders as our last line of defense and not as our first.” The Department of Homeland Security apparently shifted its focus and no longer considers border security to be our frontline defense, which certainly explains why the agency is floundering in its half-hearted attempts to safeguard our nation. While our government officials frequently complain that there is not enough manpower to handle the sheer numbers of entries into the U.S. through the San Ysidro Port of Entry, the port is about to get a whole lot bigger. Ongoing “upgrades” of the border crossing are expected to cost American taxpayers in excess of 700 million dollars. Therein lies the explanation for the glaring loopholes with border security – commerce wins over sovereignty, time and time again. You won’t hear any politicians openly discuss the real reasons for the booming traffic coming across the border, which directly hampers detection of dangerous elements intermixed with legitimate entries. In their plight to garner votes by remaining politically correct, our fearless leaders fail to deal with our failure (or willful refusal) to uphold our own immigration laws. The endless stream of vehicles and people pouring into the U.S. through our land border crossings are not just tourists sashaying across the border in search of a candy-filled pink piñata. They’re not limited to high school kids, crossing over to party and get drunk in Mexico, then coming back without their passports, with bloodied faces and bruised egos. The majority of entries that truly overwhelm our ports are comprised of Mexican individuals who obtained their “Green Cards” as Lawful Permanent Residents of the U.S., but continue to live in Mexico, while they come to work through the border, clogging it up on a daily basis at a rate of approximately 10 million such entries a year. They come through every morning, with their Green Card in one hand and their lunch box in another. It is estimated that by 2014, maximum wait times will exceed 3 hours and by the year 2030, the wait will be as long as 10 hours. While such individuals enjoy all the rights and privileges of being lawful American residents, after earning their salaries in the U.S. they pour that money directly into the Mexican economy. By continuing to live in another country after obtaining their Green Card, such aliens directly violate the rules and laws under which they were able to secure their residency. Every Customs and Border Protection Officer is explicitly aware that the traffic jam is caused by the permanent residents living abroad and crossing into the U.S. every day. When law enforcement officials as much as suggest that we start upholding our immigration laws by revoking permanent resident status of those who don’t obey our immigration laws, they’re told to keep their mouth shut and let the rule breakers come through. In a competition with our national security, political correctness and commerce take precedence. The Department of Homeland Security has the power to address this glaring problem, which would automatically do away with the unmanageable traffic at the border – but they won’t deal with it, nor will they discuss this angle on border security with the media. What will they do instead? Port Directors will continue to send radio transmissions to officers on the border, directing them not to open any trunks and to wave all vehicles straight in to speed up the traffic (especially if some high-ranking government official or a politician is expected to cross the border at that particular hour). Lookouts on the Mexican side (visible in plain sight) notify the smugglers that for the next half an hour – anything goes. At that point, trunks full of illegal aliens (including those from terrorist countries), drugs and weapons, head straight across the border and make it through. No other first world country has such a lackadaisical approach to border security – this only happens in the greatest nation in the world. Instead of dealing with the paramount terror threats at the already overburdened border crossing, The U.S. General Services Administration (GSA) – proud landlord of the San Ysidro Port of Entry – is hard at work spending taxpayers’ funds on the reconfiguration and expansion of the port, as well as the host of “environmental” or “green” improvements, to the tune of $700 million dollars. The redesigned Port is planned to include solar panels, solar hot water, low-flow fixtures, and drought resistant landscaping. Our authorities requested an assessment for potential presence of federally listed threatened or endangered species. They seem to overlook human beings, law abiding American citizens, endangered by poor border security that allows terrorist elements to enter the U.S. Instead of being concerned with planting drought-resistant cacti, our government should ponder its ability to protect our porous borders. If our great nation doesn’t respect its own sovereignty – who will?